There is something undeniably sweet and charming about a farmhouse wedding. 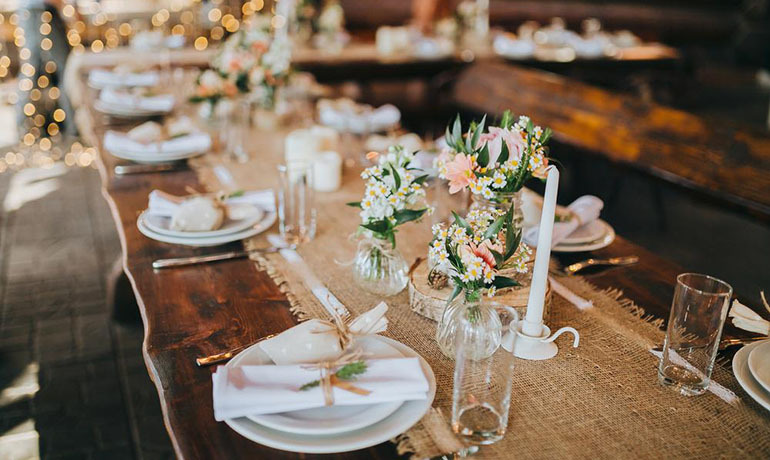 Drinking out of mason jars, eating at wooden tables, enjoying the beautifully distressed décor — all of these rustic details come together to create an elegant, yet casual setting that is perfect for any wedding celebration. Best of all, you don't need to have authentic farm roots to throw a party in a barn. In fact, many city-born brides are happily getting hitched at rustic farmhouse-style venues, both in the city and at authentic ranches and farms. So, if you've officially decided that a farmhouse wedding is for you, there is no time to waste. While planning a wedding full of mason jars and burlap detailing sounds simple enough, there may be more work involved than you originally thought. What's Behind the Farmhouse Wedding Trend? If you pay attention to interior design, you probably already know that rustic farmhouse style has been all the rage in the design world. It's no surprise that the traditional style has found its way into modern weddings as well. Farmhouse weddings have grown in popularity over the last decade as more millennials choose to get married in barns as opposed to boring banquet halls and stuffy hotels. What's behind the trend? We can tell you that the farmhouse trend is not about trying to save money. Although some rustic décor and distressed furniture may look affordable and of the DIY nature, this look doesn't always come cheap. Moreover, millennials have proven that they aren't shy about spending money on their wedding day. According to a 2018 report from WeddingWire, a millennial wedding costs $36,000 on average. More newlyweds are getting hitched in farmhouse weddings not to save a buck, but for the atmosphere. Unlike hotels, banquet halls and country clubs, a barn/ranch/farm is low-key and casual. Let's face it. Weddings can be anxiety-inducing for even the most even-keeled couple. 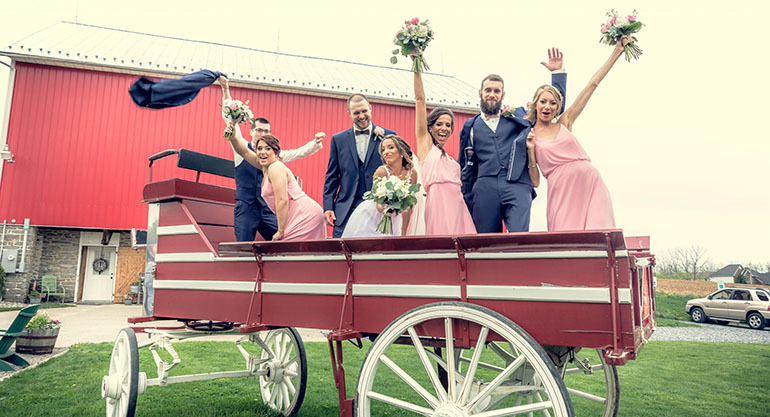 To reduce some of the stress surrounding their big day, couples are now opting for the relaxed, barn-style wedding that helps put both newlyweds and their guests at ease. Furthermore, getting married in a barn can be a truly magical experience. With the right location, whimsical décor and the perfect wedding color palette for a farmhouse wedding, you can transform an ordinary barn into a dreamy, unforgettable venue. 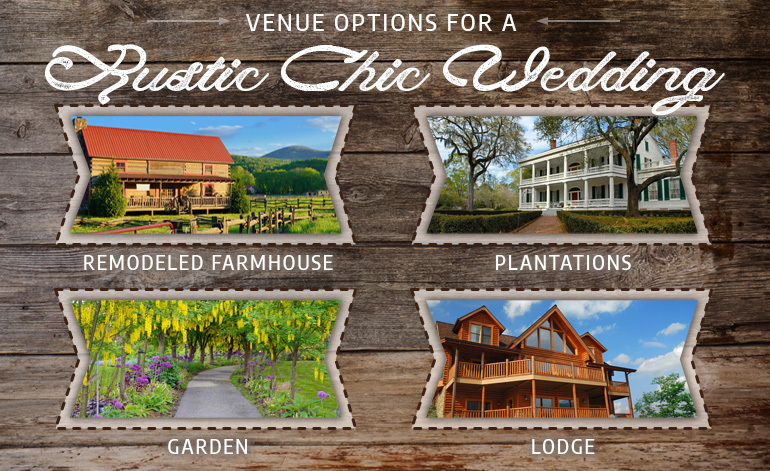 Before you get too far into planning your dream farmhouse wedding, you first need to choose a venue. Nailing down your wedding venue early is an important step because it will influence important decisions such as your wedding color palette and help you choose the best rustic bridesmaid dresses for your maids. 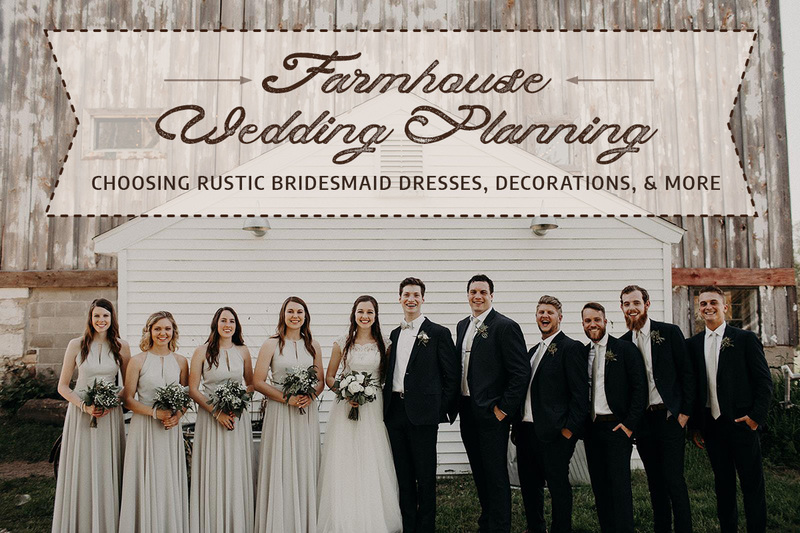 Remodeled Farmhouse in the City — Due to high demand for barn weddings, many building owners have remodeled their old barns and buildings into a rustic wedding venue for modern brides. One good reason why you should consider opting for a farmhouse in the city — it's not a hassle to get to! Your guests will appreciate the easy back and forth, especially your out-of-town guests. Plantations — Plantations are simply large-scale farms which produce cash crops such as sugar and cotton. Because of their commercial value, many plantations have historic roots that can enhance their charm as a wedding venue. Garden — On the other hand, you could always have your wedding set amid a courtyard surrounded by fresh blooms and wildflowers. With the soft sound of trickling fountains and birds chirping, this relaxing venue offers the perfect mix of classy and relaxing. Lodge — If you want something more rustic and less farmhouse, a lodge is a great choice. You can play up the scenery with natural wood details and cozy lighting to create a warm ambiance. 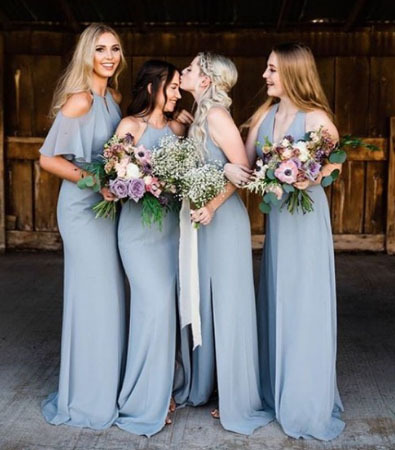 Once you've found the right wedding venue, your next step is to find rustic bridesmaid dresses that will perfectly complement your farmhouse wedding. Lighter fabrics are generally better suited for rustic weddings. However, this isn't a hard and fast rule by any means. Given that many farmhouse weddings are set in outdoor locations, it's important to choose breathable, lightweight fabrics for your bridal crew. Summertime fabrics such as lux chiffon and crepe are great fabrics for rustic farmhouse weddings and will help your maids beat the heat in their rustic bridesmaid dresses. When it comes to bridesmaid dress colors for a farmhouse wedding, you have no shortage of options. The most on-trend dress colors for a rustic wedding include pastels — think baby blues and light pinks — white, neutrals and earthy tones. Again, this isn't a hard rule. There are plenty of brides who outfit their bridesmaids in darker blues. For example, cornflower blue is extremely country-chic, despite being a darker shade of blue. If you decide to have dark colors in your wedding color palette, be sure to balance them with lighter colors as well. This will brighten up your maids' look and keep with the rustic, country-chic vibe. For example, you can instantly lighten a dark navy bridesmaid dress by having your maids wear white shawls or carry bouquets with contrasting colors. Keep in mind that farmhouse weddings are generally casual and some dresses may appear too fancy for your venue when paired with certain shoes and accessories. For example, floor-length gowns are considered more formal than shorter dresses, so you may want to skip the fancy jewelry if your gals are wearing full-length bridesmaid dresses. Finally, don't forget, how your maids style their hair can have a huge impact on their overall look. If you want to offset the formality of a longer dress, consider having your bridesmaids wear their hair down in a simple style. On-trend and ultra-chic, floral bridesmaid dresses fit right in at country-chic weddings — and good news! You have a lot of options when it comes to floral dresses for your bride tribe. From big floral patterns that make a stunning visual impact to subtle prints that are soft and sweet, the world is your oyster when it comes to floral dresses. One of our favorite ways to sport this trend is by having your bridesmaids wear mix and match bridesmaid dresses. With the mix and match floral trend, you can have some of your bridesmaids wear solid colors and others wear florals. This creates balance and structure to your bridal party. It also lets them choose whether or not they want to wear florals, which your maids will no doubt appreciate. 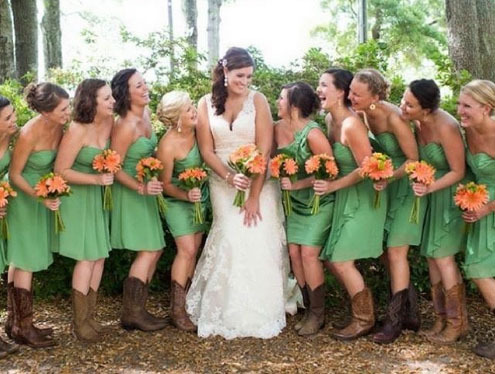 Finally, don't forget that your bridal party's bouquets can significantly influence the vibe you're going for. For a farmhouse wedding, you want to add plenty of foliage and greenery without being too overwhelming. Baby's Breath is the perfect flower for your bridesmaids' wedding bouquets because it fits right in with the rustic vibe. It's also affordable, as far as flowers go. If you're willing to go the DIY route, you can always make your own rustic bouquets. As long as you keep things simple, this should be an easy DIY that you and your maids can do together. You've made it to the décor part of planning your farmhouse wedding. Congratulations! Now it's time to create a magical space that is full of rustic charm and beauty. While we certainly don't want to stop you from being crafty and going the DIY route, we do want to warn you that making sophisticated rustic décor isn't as easy as it looks! But if you're determined to show off your crafting skills, then there are some wedding décor items that lend themselves well to the DIY-er. Centerpieces — Centerpieces, in particular, are ideal for beginner DIY-ers because they can be as simple as sticking baby's breath in a mason jar and tying a bow around it. They're beautiful, simple and right at home in a country or farmhouse wedding. 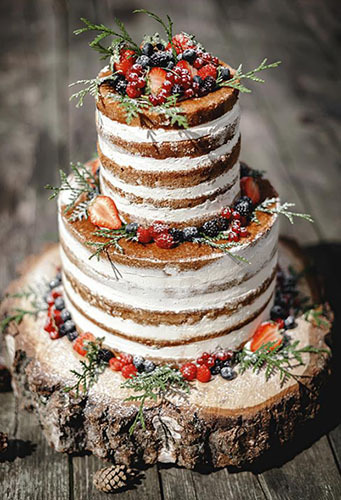 Cake Holder — If your wedding is set in a lodge and very nature-inspired, wooden slabs are great cake holders or general display props. They look effortlessly rustic and are super affordable, depending on the style of slab. 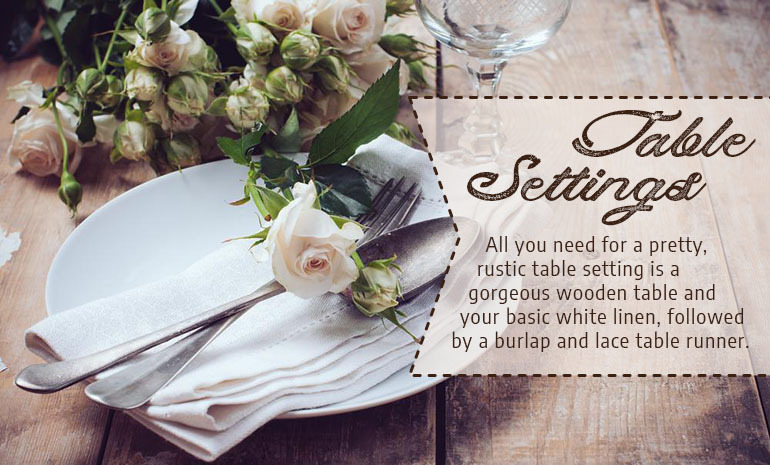 Table Settings — All you need for a pretty, rustic table setting is your basic white linen, followed by a burlap and lace table runner. If you have a gorgeous wooden table, skip the linen and simply run a burlap table runner across it to show it off. You can also play up your table with DIY table candles or wine bottles by wrapping them in twine. Ceiling Drapes — Keep in mind that barns and lodges have high ceilings, which can feel cavernous. Consider hanging fabric from the ceiling to make the space feel cozier. Don't forget to add further ambiance with hanging lights. Don't Skimp on Flowers — Farmhouse venues can be dull without lots of lush greenery and flowers. While you don't need to go too crazy, try to be strategic with your flowers and foliage. Use a combination of tall foliage and short flower displays to mimic the outdoors. Tone Down the Cake — If your farmhouse vibe is simple, don't opt for an extravagant cake. Keep the cake simple and in line with your rustic theme. This cake is perfect for a simple, farmhouse wedding because it includes berries that look as though they could have been picked straight from the farm. Getting to the Venue — There is another good reason why bridesmaids prefer wearing boots to country weddings. Walking in heels across a grassy or muddy area can be a complete nightmare. Be sure to warn your maids if you aren't wearing appropriate footwear for the countryside. Ease of Parking — Don't forget that your guests need to be able to access the venue with ease as well. If the barn or farm is muddy, guests in wheelchairs are going to struggle. 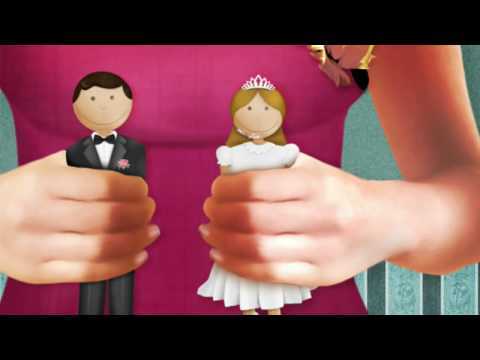 Keep them in mind when planning your wedding to ensure that everyone is taken care of. Additional Costs — The only downside of having a farmhouse wedding in a real barn is that they aren't made to accommodate weddings. You may need to factor more into your wedding budget for items such as chairs, tables, lighting, bathrooms, heat generators and more. Take Care of Bugs — The downside of outside weddings in the summertime are the insects. Consider having mosquito traps around and offering bug spray to your guests later in the evening. Throwing a spectacular farmhouse wedding takes careful planning and consideration. After all, you could be getting hitched in a barn that was originally made to house animals — not people. Despite the additional workarounds, a farmhouse wedding can make for a magical and unforgettable evening. With a little tireless planning and the help of your bridesmaids, you can pull off a farmhouse wedding that oozes charm and rustic beauty.